My work as an artist has long been rooted in my love of the richly visual and deeply metaphorical phenomena that is light, and my paintings are meant to evoke the experience of light in some way. Light is an absolutely primal element of human experience, separating us from darkness through an amazing range of effects. Without light life as we know it is inconceivable. 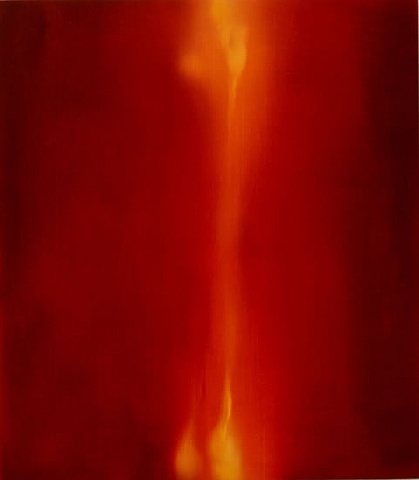 In the series Watching Fire I have turned my attention to a source of light and warmth that has captivated humans since our earliest beginnings. At our present moment we stand at a distant remove from the early humans who huddled in caves and rude shelters and whose only sources of light were the sun, the moon, the stars and later, fire. It can be argued that the stirrings of consciousness may have truly begun when humans gained control of fire, and that society as we have come to know it probably began in the circles that gathered around these early fires where language, stories, and songs were, no doubt, born. For this series I have taken those first fires as a starting point. It is deeply rooted in human experience to find a primary comfort simply staring into a fire, taking comfort from its warmth and finding fascination in its rich colors and flickering motion. Yet fire with its' searing heat and destructive powers can also stir darker fears that are themselves as old as humankind and has served to signal mortality and the all consuming flow of time. But the heat of fire is representative of the heat of life itself and the light emanating from its' flames has also been used through the ages to symbolize knowledge, justice, and transcendence. Through the centuries fires have been lit in celebration and in mourning, in triumph and despair. Fire communicates a very basic human message; I am here, I am warm and alive.